Deeks: This thing? Kensi: Yes. Our thing. Deeks: I'm sorry. I didn't -- I didn't hear you because there are so many people walking by. Maybe say it louder. Once more just for me. Kensi: I hate you. Deeks: You don't. You don't. You don't hate me. Kensi: Our thing. Deeks: Wow. Phew. Kensi: You have to promise me something too. Deeks: Anything. Kensi: Promise you'll be patient with me. Deeks: See you tonight. Kensi: Yeah. The fight is on! 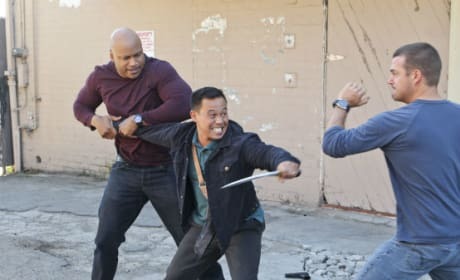 This is a scene from the NCIS: Los Angeles episode "The Frozen Lake." Kensi and Deeks try to find the balance in their partnership on NCIS: Los Angeles. "The Frozen Lake" is the tenth episode of the show's fifth season.